Why do some trumpets play better than others? As far back as I can remember, it’s been an article of faith for trumpet players: To get a good trumpet, go somewhere where you can try a lot of identical instruments and pick out the good one. That used to work, sort of. Years ago, large stores and even some smaller ones carried multiple samples of the same instrument which they would dutifully roll out to be tried. The problem was that, unless you happened to be there when a new shipment arrived, you could safely assume that the trumpets you were trying had already been picked over by numerous players. Plus, it can be very difficult to access small differences in a short time span and in an unfamiliar acoustic. Nowadays it’s pretty much a moot point. The economics of the music business make carrying a large stock of instruments a losing proposition. So, what makes some trumpets good, others just OK, and a few real “dogs”? How do you pick out the best one? On the face of it, shouldn’t they all be the same? After all, they’re made in the same factory, out of the same parts, and by the same people. Why are they different? And what steps can you take to make sure you get a good one? Every maker begins a product line with a prototype instrument or two. These instruments are made by hand, by the finest craftsmen available, and are tweaked and adjusted until they’re as perfect as they can be. It’s not surprising that they are very good trumpets. The question is: what happens when these instruments move from prototype to production? Do they maintain the same quality and if not, why not? If the factory instrument differs from the prototype in its playing qualities it seems reasonable that it must differ in its specifications as well. The closer the instrument is to the original design the more likely it is to play as the designer intended. There are a lot of places for an instrument to go wrong in the construction process. The bore can be obstructed by solder or burrs or constricted by a too-tight assembly, slides and valves can be too loose or too tight, valves may not be in perfect alignment. There are other, more subtle issues as well. The bell bow may have become flattened during the bending process, the mouthpiece receiver may not be concentric, or the venturi may be too small or large. Carefully measuring and correcting these defects restores the craftsmanship component to factory-build instruments and makes them play the way they were designed to. When we get your instrument Jim will examine it and recommend the adjustments that he thinks will make the most improvement. Usually, the work can be done in a day or two. Brass instruments have traditionally been cleaned with a combination of soaps and chemical baths, accompanied by a good deal of hand scrubbing. In recent years ultrasonic cleaners have come into the picture, offering a different cleaning method. Which method gets your horn cleaner, which is safer for the horn (and you)? How do you choose? As a brass instrument is played, deposits build up on the inner surfaces. These include old grease and oil, food particles, dental plaque and bacteria, calcium, and copper carbonate, the material formed by the reaction of the acids in your breath and the copper in the alloy. Copper carbonate builds up green, rock-hard deposits. It’s the primary cause of sticking and other action problems in rotary valve instruments. If the mouthpipe is brushed out once a week or so and the instrument is oiled frequently enough, a brass instrument can go for years between Chem/Ultrasonic cleanings. In actual practice, however, this rarely happens and a cleaning is needed every year or so. q-tip. Then the instrument is scrubbed again with detergent to remove any residue and is re-assembled. Ultrasonic cleaning replaces the hand scrubbing with sound waves. The disassembled instrument is put into a tank of cleaning solution and bombarded with sound waves. The sound waves cause microscopic bubbles to form in the fluid. These bubbles immediately collapse, converting the sound waves into kinetic energy. This process, called “cavitation”, creates the scrubbing action that cleans the horn. One of the big advantages of ultrasonics is that that scrubbing action reaches all through the inside of the horn, even into areas unreachable by brushes. When using ultrasonic cleaners it’s important to be aware of their power and potential for damage. The microscopic bubbles are very good at finding their way into the pinholes left by dezincification and opening them up. So, older instruments and instruments that show any signs of dezincification (red rot) should not be ultrasonically cleaned. Ultrasonic cleaning can also remove some lacquers. So, it’s important to use the least power and the shortest time that will do the job. In our shop, a typical cleaning may involve both ultrasonics and traditional techniques. We choose the combination that’s safest and most effective for the instrument. Hi All — Last year I had Jim Becker at Osmun do a valve job on my 1968 Olds Special. He turned a “Special” into a “Fantastic.” This past week, he did a valve job on my 1954 Olds Recording, with the same result. The horn is the off-the-map good. In my view, for a vintage horn, there’s no bigger bang-for-the-buck than a valve job, as long as the rest of the horn is sound. Jim also goes the extra mile, always finding other things to correct along the way (my Recording came back with the bell straightened out and with O-rings on the third valve slide). He’s an expert’s expert, fair in pricing, and a nice person to boot. Thanks, Jim! Be sure to check out the Trumpet Services page at osmun.com. Jim Becker and I are off to the ITG conference in King of Prussia, PA. We’ll be there with trumpets, mouthpieces, and all sorts of things to make your life as a trumpet player happier and more rewarding. We’re very proud to display Jim’s latest hand-made instrument. It’s a large bore Bb trumpet designed for the lead player. The prototype was built for 1st call big band and show player extraordinaire Larry Pyatt, who provided us with valuable feedback every step of the way. 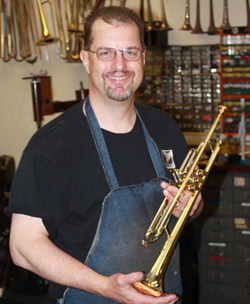 Jim will be available to talk about blueprinting and all the ways he can make your trumpet just a little bit better (We call it “The last 2%”). We have a Bach Bb and C that we’ve blueprinted for you to try. I think you’ll be amazed at the improvement over stock horns. Please stop by and say hello.